Welcome to my Spring newsletter and thank you for signing up to receive it! In the past few months I have had the pleasure to teach for guilds/stores in Massachusetts, New York, Florida and just this past week in Minnesota. It was GREAT to see some of you again and meet many for the first time. 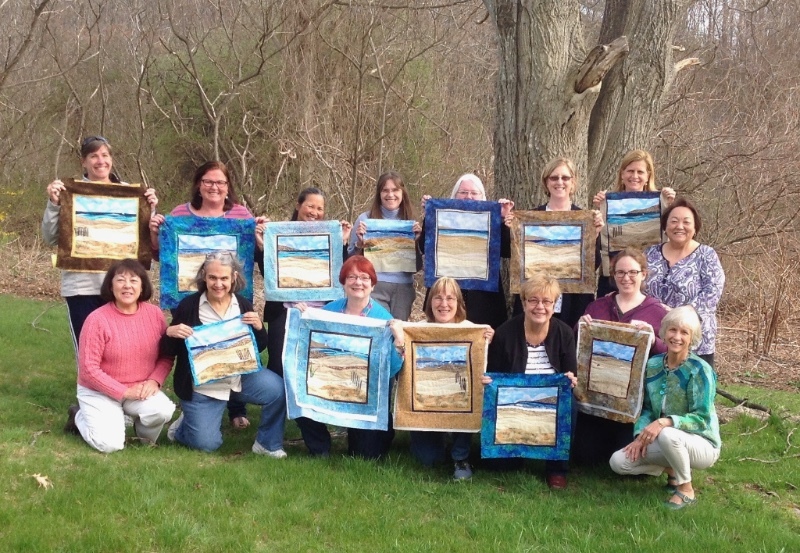 Here’s the happy group from the Accidental Landscapes: Beaches workshop held at the Red Barn Sewing and Yarn Center in Merrimac, MA this month. 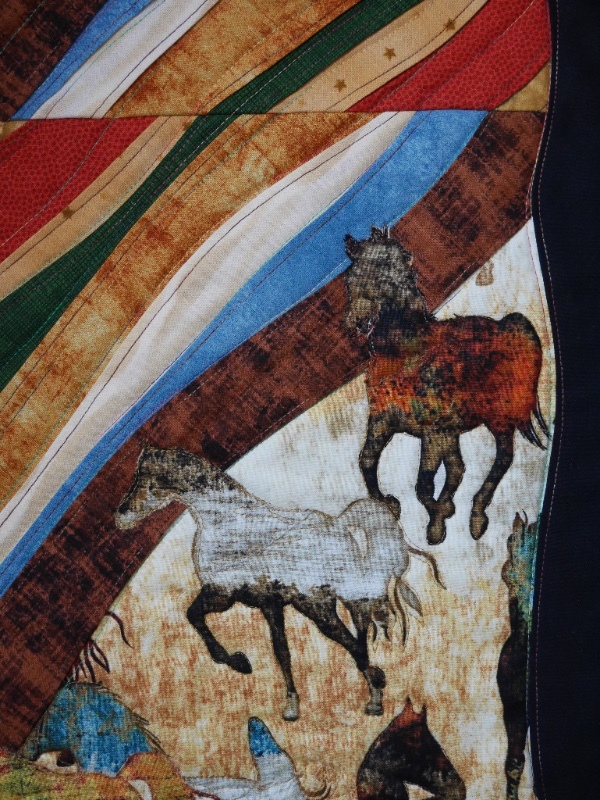 The day wasn’t even quite over and look how far everyone got…..borders on and several quilted. For those of you who have taken a Beach class you will notice that we did a larger size. In the photo you can tell it’s Spring in New England. The grass is just starting to get green and the trees have a long way to go with their leaves. Here is a sneak peek at just a few samples of what I have been playing with lately. What I can share with you right now, is that there will be lots of waves, wiggles, twists, twirls, swirls, logs, leaves and Random Roses for all seasons, celebrations and décor. 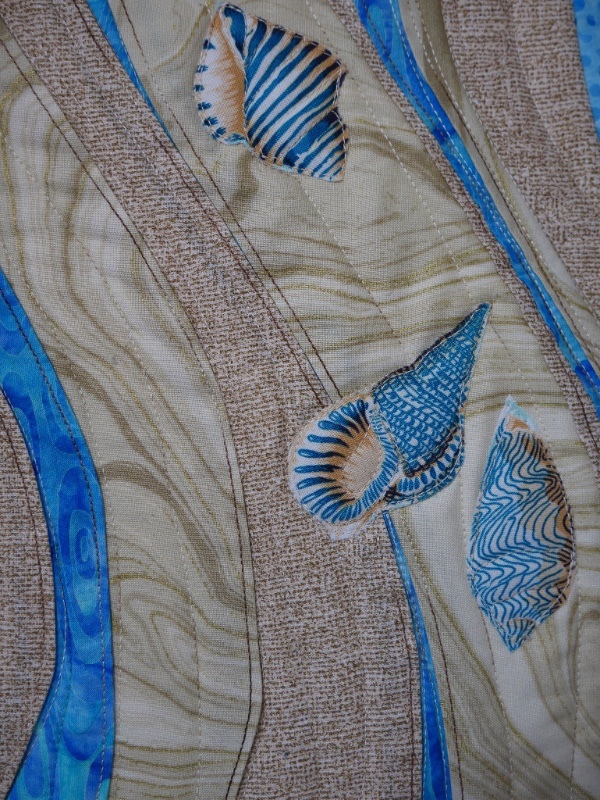 All curves, and angles too, will be topstitched using my layered topstitching technique (Layered Waves). 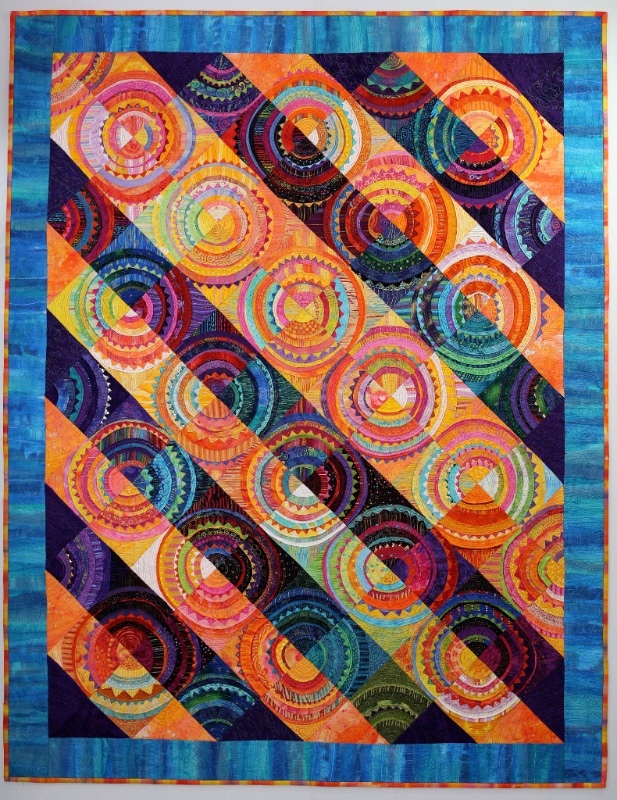 The quilts will have curves in the blocks, in the borders and even on the outer edges! 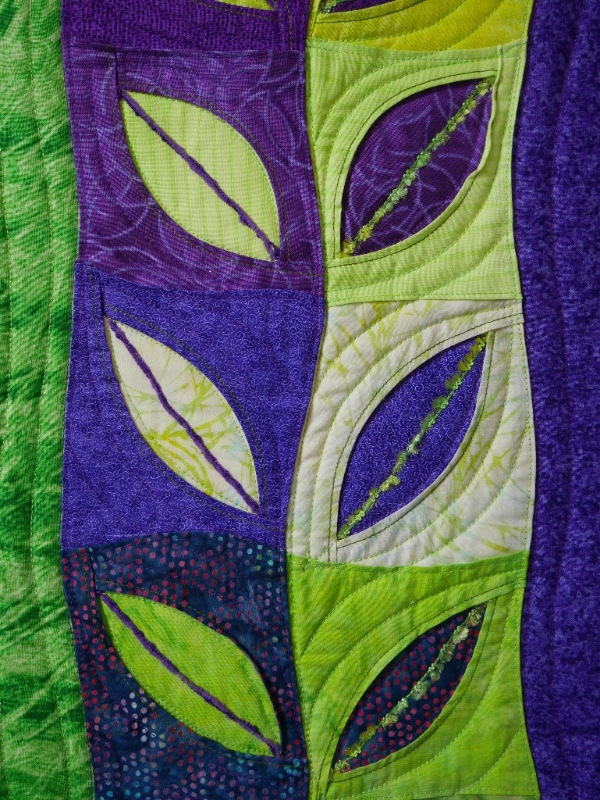 The best part is that everyone can sew a curve easily when it’s topstitched. If you have taken a workshop with me, you know this is true, right?! 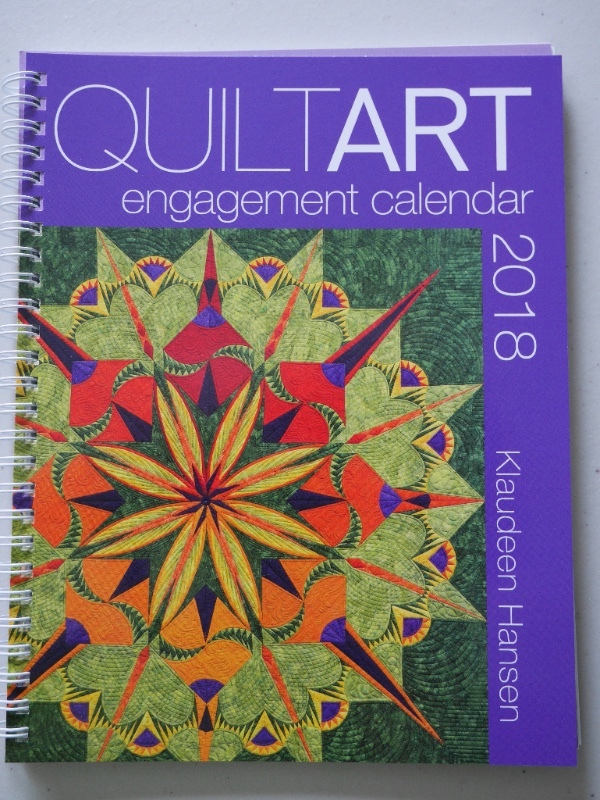 The quilts in the book can be used as a table runner, wallhanging or combined to create a small quilt. 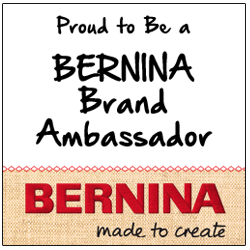 More to come in the Summer newsletter! 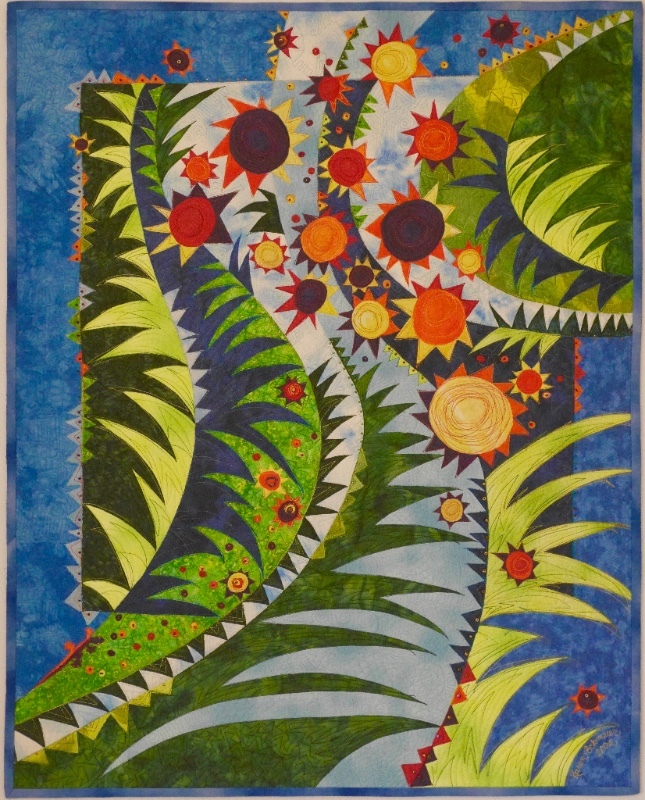 My April exhibit at the Southbury Library, in Southbury, CT ended two days ago. 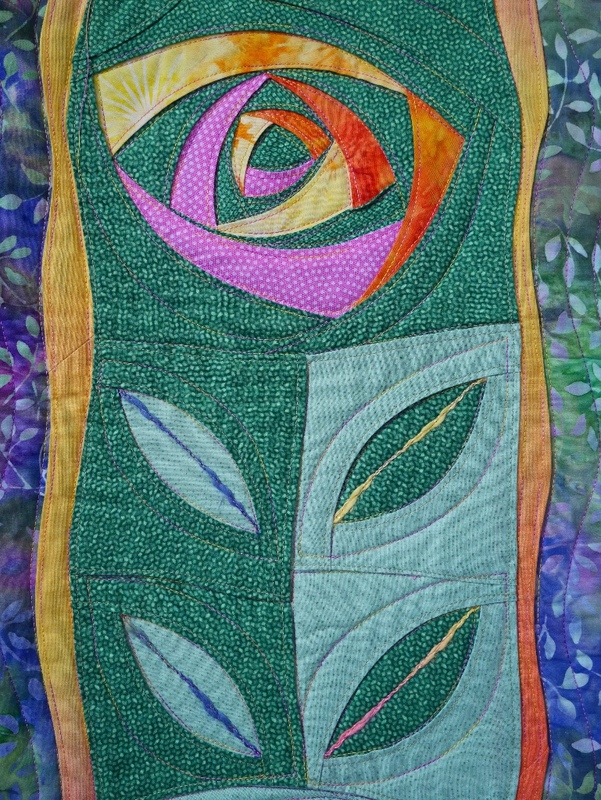 I don’t often sell my quilts, but am happy to announce that two of my quilts have found new homes. Collaged with layer of tulle, hand painted fabrics, and beads (and a lucky lizard). Topstitch piecing, metallic foiling and raw edge collage. 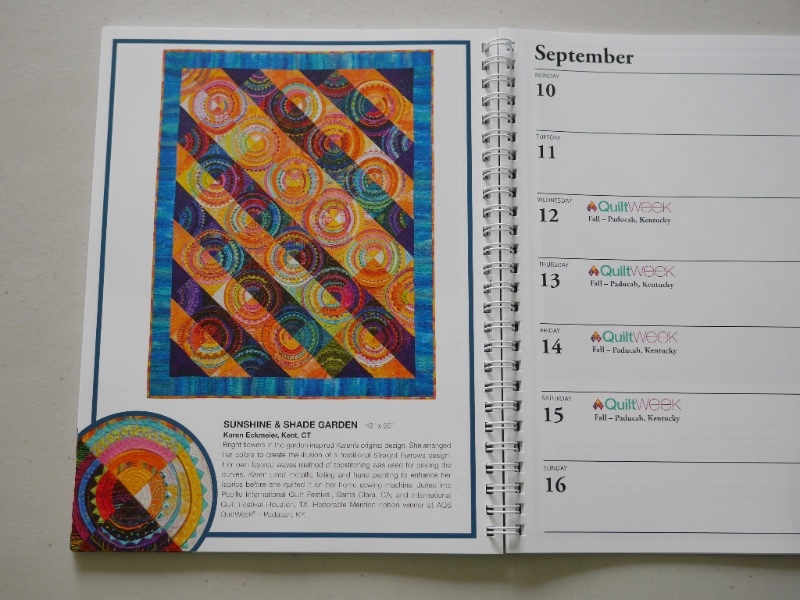 Not only did I sell “Sunshine & Shade Garden” (2015) this week, but it is featured in this calendar as well. If you live in Utah or nearby, please visit this exhibit. 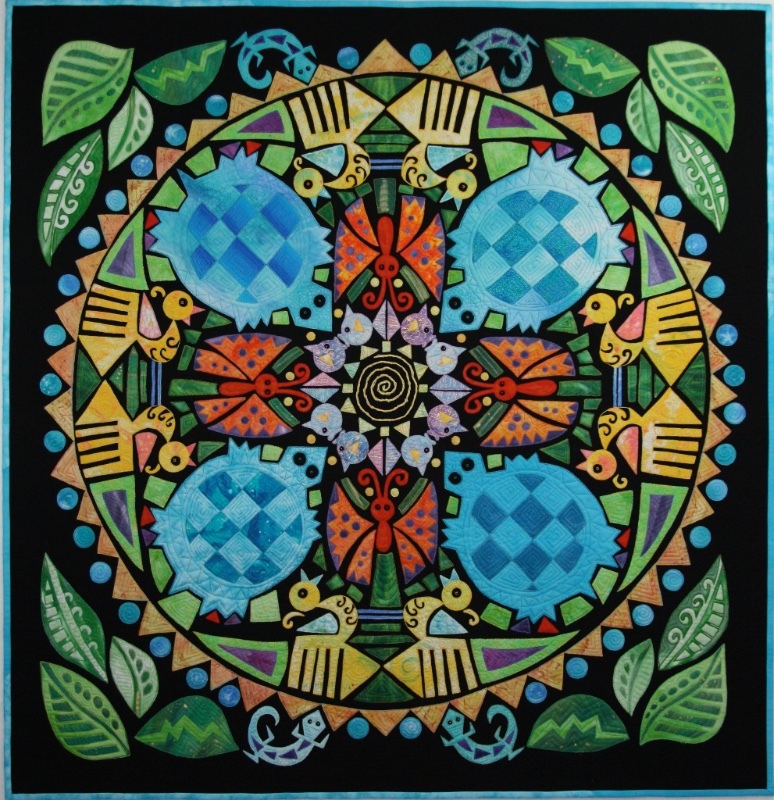 Two of my quilts will be included. 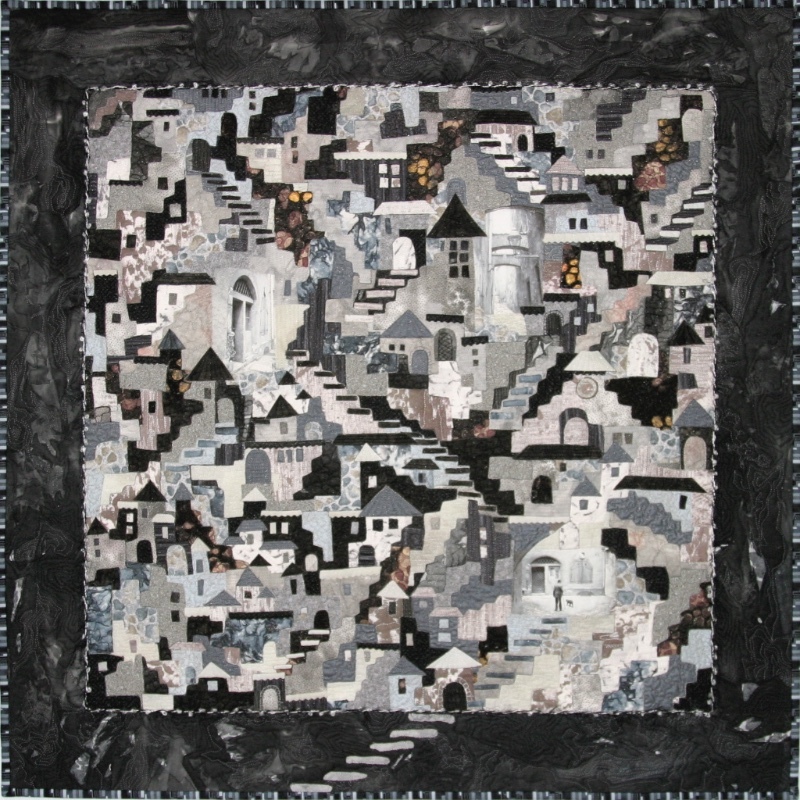 Altstadt 35” x 35” (2006) – Collage with layer of tulle, photo transfers, couched yarns. Next week I will be teaching in Connecticut. 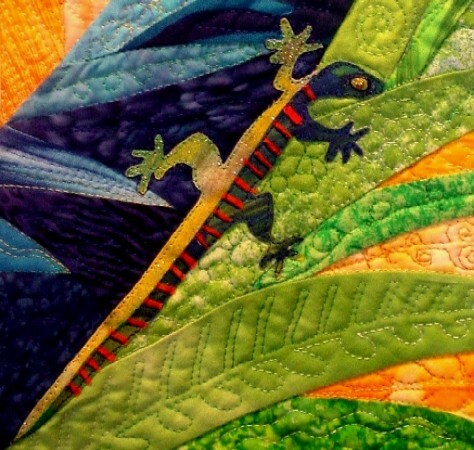 Then my workshops will take me all over the country, as usual, which is lots of fun for me to visit new places, meet new quilting friends and share my techniques with you.